Underdeveloped and developing regions are among the most important arenas for social design and increasingly attract broader interest from other fields of research and practice. Participatory design and co-creation are typical approaches to collecting indigenous wisdom and creating design solutions with social empathy and inclusion. However, the unequal involvement of local participants and inherent knowledge barriers evident in collaborations frequently lead to problems in the suitability and sustainability of systems built in the design process. Strategies and methods for engaging local communities more deeply in co-creation are needed to address these issues. 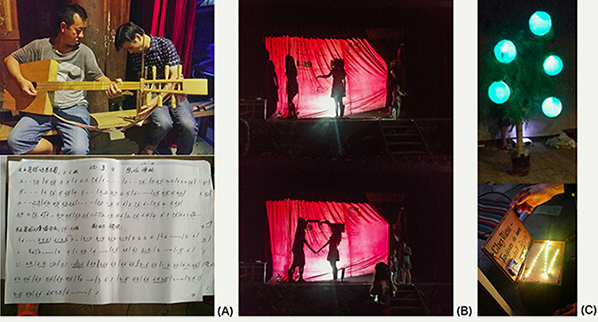 Following transdisciplinary empirical studies in real-world rural Chinese settings, we explored the novel use of interactive drama to engage a local community in short-term cross-cultural co-creation with the goal of building the core characteristics of a local but better community. The results from the participatory process and participants’ feedback are promising, with clear indicators of community engagement and knowledge sharing beyond the design process itself. The lessons learnt and approaches discussed in this paper provide a starting point for increasing community engagement with social design practices and research across different societies. Keywords – Co-Creation, Community Engagement, Interactive Drama, Participatory Design, Social Design. 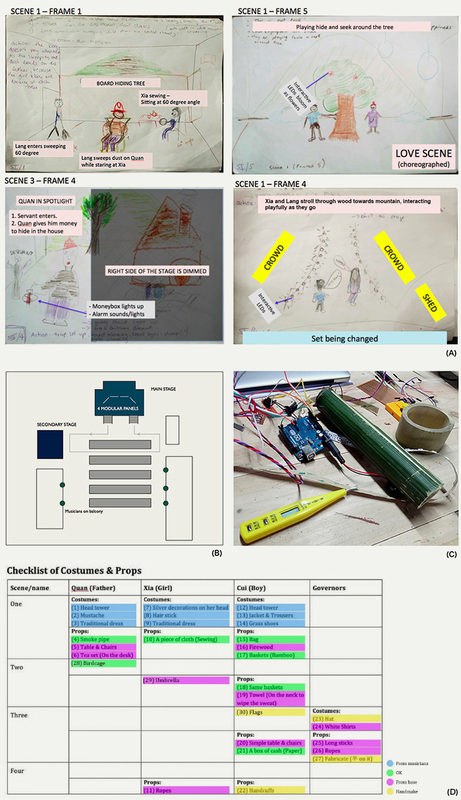 Relevance to Design Practice – This study analyses different design paradigms in social design, and explores a new community engagement approach through interactive drama. The findings serve as a valuable reference for co-creation with rural communities. Citation: Wang, W., Bryan-Kinns, N., & Ji, T. (2016). Using community engagement to drive co-creation in rural China. International Journal of Design, 10(1), 37-52. Received Sept. 24, 2015; Accepted Feb. 5, 2016; Published April 30, 2016. Copyright: © 2016 Wang, Bryan-Kinns, & Ji. Copyright for this article is retained by the authors, with first publication rights granted to the International Journal of Design. All journal content, except where otherwise noted, is licensed under a Creative Commons Attribution-NonCommercial-NoDerivs 2.5 License. By virtue of their appearance in this open-access journal, articles are free to use, with proper attribution, in educational and other non-commercial settings. Dr. Wei Wang is Senior Researcher at Hunan University and Visiting Scholar at Queen Mary University of London. He currently leads Human-Centered Design at the HNU Media Lab (Shenzhen) with industrial partners and local startups in interactive technologies and smart hardware. He worked at the Nokia Research Center from 2008 to 2012 as Member of Research Staff, Senior Designer and then User Experience Lead; he participated in and led multiple projects in new HCI technologies and user studies in emerging mobile/wearable platforms and applications, and supported Nokia’s product strategy in growth markets. He has been granted 17 US/EU/CN patents in HCI and information service, and received a Nokia Annual Achievement award in 2010 for the successful technical transfer of Nokia music service based on ethnographic research in Kenya. He is Deputy Director of the Information & Interaction Design Committee, China Industrial Design Association. Wang received his PhD in 2008. Dr. Nick Bryan-Kinns is Reader in Interaction Design and Deputy Dean for Science and Engineering at Queen Mary University of London, and Visiting Professor of Interaction Design at Hunan University. He leads Interactional Sound and Music at QMUL and has published award-winning international journal papers from his multi-million-pound-funded research. Bryan-Kinns held a Royal Academy of Engineering Industrial Secondment in recognition of his work on commercializing academic research. He has provided expert opinion for the NSF and the European Commission, and chaired the ACM Creativity and Cognition conference 2009, and BCS-HCI 2006. He is a BCS Fellow, recipient of ACM and BCS Recognition of Service Awards, and founding chair of the ACM Creativity, Cognition and Art Community. Bryan-Kinns is a Chartered Engineer and received his PhD in 1998. Professor Tie Ji is Deputy Dean at the School of Design, Hunan University. He leads the Communication Lab at Hunan University as a founding member of DESIS China and LeNS (Learning Network on Sustainability). His research and practice mostly focus upon social innovations and design in rural China, including founding the “New Channel” program in 2009, initiating the “Lotus Prize” Design and Innovation Competition for social engagement, and curating the 2012 Sino-Italian Design Exhibition, and more recently the “Xiang” Culture Maker Joint Exhibition at the 2015 Milan Expo Gate. He is General Sectary of the Teaching Instruction Commission of Industrial Design in the China Ministry of Education. Designing for the public good, especially in disadvantaged communities, has attracted significant interest in recent years with both practicing designers and students seeking opportunities in this burgeoning area of design for social impact (Smithsonian Institution, 2013). Underdeveloped and developing regions in Africa, India, and China have become some of the most important arenas of social design practice; for example, GoGlobal is a collaborative design research activity initiated in 2005 focusing on the creative industries in developing countries (Barker & Hall, 2009; Lin, 2007). More broadly, DESIS (DEsign for Social Innovation and Sustainability) is a social innovation network endorsed by the United Nations Environment Programme (UNEP) connecting labs and practices across the globe from Africa (Ambole, M’Rithaa, Moalosi, & Molokwane, 2012) and South America (Rosa & Figueiredo, 2012) to China (Gong, 2014). Academics have also developed various exploratory cross-disciplinary approaches to social design practice as discussed below. For example, Bidwell and Winschiers-Theophilus (2012) developed Audio Pacemaker, a “walking and talking” tool, to provoke reflection by indigenous knowledge holders on their interaction with technology. Jin, Crul, and Brezet (2014) introduced the Future Living Studio as a platform for intercultural exchange and to influence strategies on sustainable design and production issues for Vietnamese companies’ branded products. The underlying theme we find in these approaches is that community engagement is becoming increasingly recognized as an important element, and in some cases determines success and sustainability. Reflecting the practices in underdeveloped regions, we see social design as not necessarily about a professional designer designing things for people, nor as necessarily about facilitating local people to design with new technologies and methods. For us, the design process can be social in that it engages people to think about and design their own futures, using their own ingenuity and locally available resources (Burkett, 2016). In practice, this kind of co-creation requires all who are involved to develop empathy, to share, and to accept equal partnership in the creation process (Fleischmann, 2013). Furthermore, effective participation is based on knowledgeable participation (Woodhouse & Patton, 2004). However, the reality is that educational and literacy levels are usually relatively low in underdeveloped communities, and the local populations often do not have the opportunity to access new technologies, nor to build on public design and knowledge platforms. These local realities block their chance to improve their poor situation. The challenge for us as social designers is therefore not how to design for or with local communities, but rather how to engage local communities in design, given the local realities of lack of education, enabling technology, and design awareness. In this paper we start by reviewing the realities of applying participatory approaches to design in rural settings, and the inherent challenges for social designers. We then identify requirements for a new design approach based on empirical studies of our practices in the social innovation program “New Channel” in rural China. From our case studies, we analyze short-term and long-term co-creation processes, and compare different design paradigms. Following this, we develop a paradigm for design which uses transdisciplinary methods, including interactive drama and digital making, which are deployed in a real-world setting, and discuss the advantages and disadvantages based on our evaluation in the field. Our paper concludes with a reflection on the impact of our approach for social designers and rural practices, and reflects on the shortcomings of our study. The “off-grid” location and lack of infrastructure of rural communities means that historically people in underdeveloped regions remain isolated in development and excluded from the advantages and benefits of modern design in a global socio-technical context. Conversely, they often have to suffer the side effects of economic globalization such as economic migration leading to family and community fragmentation (Lundestad, 2004). Participatory approaches to design, which emphasize social empathy and inclusion rather than a rigorous design discipline, are often presented as effective methods for connecting disadvantaged communities and collecting indigenous wisdom. For example, Bergvall-Kåreborn and Ståhlbröst (2008) categorized the different participatory relationships in such design processes as design for users, design with users, or design by users. In traditional participatory design (PD) research and practice, participants who live in the situation would be treated as the user (or worker) (Muller, 2002). This kind of participation focuses more on contributing user knowledge rather than on creativity and taking design initiative. Furthermore, this kind of participation, or user involvement, is often viewed (incorrectly) as passive. In addition, a common problem is the sustainability of systems built through a participatory process; as Kensing and Blomberg (1998) noted, “when the researchers leave, the participatory processes seldom diffuse to other organizational entities.” Carroll and Rosson (2007) suggested that when people “understand the value of their own knowledge” with respect to the requirements and design of IT systems, “they become less intimidated by information technology, and more able to act” (p. 257). Conversely, there is a risk that the benefits of designers’ energies and skills are often most greatly felt by those who most resemble the proximate designers (Woodhouse & Patton, 2004). From these challenges, it is clear that eliciting and sustaining the participation and engagement of the broad local community becomes a key concern of social design. Additionally, an important distinction exists between co-design, where the focus is on the output of a design process which draws on the expertise of participants, and participatory design, where the focus is on how to facilitate the engagement of participants with different voices and opinions in a shared creative process (Bannon & Ehn, 2012, p. 41). Participatory design’s sensitivity to inclusivity and its focus on engagement with design rather than for design potentially offer greater opportunity for early-stage co-creation and for building the mutual trust and respect necessary to enable honest co-design work with rural communities whose education, awareness of technology, and cultural perspective often make attempting co-design activities problematic. Indeed, Mulgan (2006) noted that in some societies “social innovations are strangled at birth” when societal structures act against successful deployment of co-design methods which rely on openness of communication and shared resources. Winschiers-Theophilus, Bidwell, and Blake (2012) proposed a more indigenous viewpoint, referred to as design by indigenous community consensus, and developed guidelines for community design, including participation for community empowerment, situated redefinition by mutual learning, and changing roles from meta-participant (e.g., facilitator) to participant. Social innovations are usually new combinations or hybrids of existing elements, rather than being wholly new in themselves. Putting social innovations into effect usually involves cutting across organizational, sectoral or disciplinary boundaries (and often tapping into new sources of value by arbitraging ideas and knowledge). Social innovations, unlike most technological ones, leave behind compelling new social relationships between previously separate individuals and groups. Social design for us means not only design for social purposes, but also social engagement with approaches to the design process. This brings three main challenges for social designers which we explore in this paper: (i) multiplicity of roles; (ii) pragmatics of immersion; and (iii) meaningful engagement. The complexities of engaging local communities in co-creation mean that social designers must take on multiple roles beyond conventional design. Merkel et al. (2004) noted that “working with community groups expands the role of designers into lurkers, facilitators, consultants, and bards and foregrounds the need to find ways of communicating this role to community groups” (p. 7). Moreover, embracing a dialogical attitude has been emphasized as key to successful social design; for example, Cipolla and Bartholo (2014) explored the use of a dialogical approach to socially responsible design, whilst Winschiers-Theophilus et al. (2012) addressed the importance of dialogue in building community consensus. Social designers become the dialogical intermediaries between different societies and cultures, requiring them to challenge and change traditional design mindsets. Indeed, the term cultural intermediaries was initially introduced to describe the reproductive role between cultural production and consumption (Negus, 2002), where designers have been described as key cultural intermediaries designing symbolic goods and services, especially reproducing products based on “local” cultural resources (Zurlo & Bohemia, 2014). A key role that social designers must now take on is that of facilitator. For example, Margolin and Margolin (2002) proposed discussing product design from the perspective of social service intervention as “a practice whose principal objective is to meet the needs of underserved or marginalized populations.… Central to social work theory is the ecological perspective meaning” (p. 25). This approach mirrors PD concerns for inclusion and the embracing of marginalized voices. However, the emergence of these required competencies for social designers challenges current design education. Margolin and Margolin (2002) suggested, “Students of social design will have to learn more about social needs and how they are currently addressed.… They would also need a stronger background in sociology, psychology, and public policy” (p. 29). In response to this trend, design schools add “social” courses and activities into their curriculum, but few of them try to present social design as a discipline or a major. For example, in China, many students are passionate about participating in sustainable design workshops such as the annual “UpCycling” activity (sponsored by the British Council) or other social innovation activities, but few students would choose to be a social designer as the first step of their design career. The second challenge for social designers is to deeply immerse themselves in the local culture and actually undertake practical design work. For pragmatic reasons, most social designers have limited time to live in local communities. Furthermore, they have usually lived an urban life and have very little experience of rural living, and typically no sense of how to communicate with local people. Whilst the university-based design initiatives offer an inexhaustible supply of student labor and transdisciplinary professionals, spending just a few weeks in rural locations is only sufficient for a “quick and dirty” ethnographic process (Hughes, King, Rodden, & Andersen, 1995). This kind of participation is piecemeal both for outsiders and the local community, and creates the need to develop approaches to rapidly immerse outside designers in the local culture, hand in hand with an integrated approach to co-creation. The practicalities of using, sourcing, and building technology are a second element of the pragmatics of local immersion. Whilst ideas such as appropriate technology (manufacture using local resources for local needs), as suggested by Schumacher (1973) are aspirational, practical implementations in rural locations are very challenging. Sanders and Stappers (2014) addressed this concern by including making as part of a practice of participation through the comparison of three approaches: probes, toolkits and prototypes, and locating these in the co-design process. Although this approach can provide an appropriate solution “on the ground” in a local context, it relies on the introduction of a set of new, low-cost and robust making techniques into underdeveloped communities, which is not always feasible. The final challenge for social designers is concerned with what is actually implemented in a local context. The collaboration and making take place within a local network of people whose links are not necessarily transparent to outsiders (Winschiers-Theophilus et al., 2012). Correspondingly, in many cases, and from our hands-on experience, social design is often seen by local people as just a process of watching bustling outsiders’ fieldwork with a few invited local participants—the design process often has no meaning for local people in their cultural frame of reference. Furthermore, from our experience, local communities want tangible outcomes and implementations before the social designers leave, not only presentations and written documents. We found that if clear and tangible outcomes are not provided, local people become fatigued and even repelled by several rounds of interviews, pilots, observations, evaluations, and so on. To explore new approaches to co-creation we engaged with the Kam minority community in Tongdao county in Hunan province, central south China. Tongdao is a mountainous county in the southwest corner of Hunan, which is a typical agriculture-based, low-income rural area of China. It is also home to a Chinese minority community, the Kam (侗 in Chinese, approximately 3 million population). The Kam’s culture is unique and famous for their wooden buildings with exquisite structures, their ethnic music, and their local customs (see Figure 1). This traditional community has been harmoniously self-regulated by a local elders’ committee and kinships for hundreds of years with some features of a matriarchal society still prevalent, such as democratic decision-making processes for public issues, and the higher social status of women and elders in the community. Figure 1. Tongdao’s local setting, architecture, crafts, and intangible cultural heritage (Wang et al., 2014). However, just like other traditional Chinese rural communities, Tongdao has faced many socioeconomic and cultural problems in recent development and social transformation, including challenges to traditional rural lifestyles, agricultural society, and craft productions, the fading of the sense of local community and the impact of population migration on cultural values (Wang, Ji, & Jaafarnia, 2014). 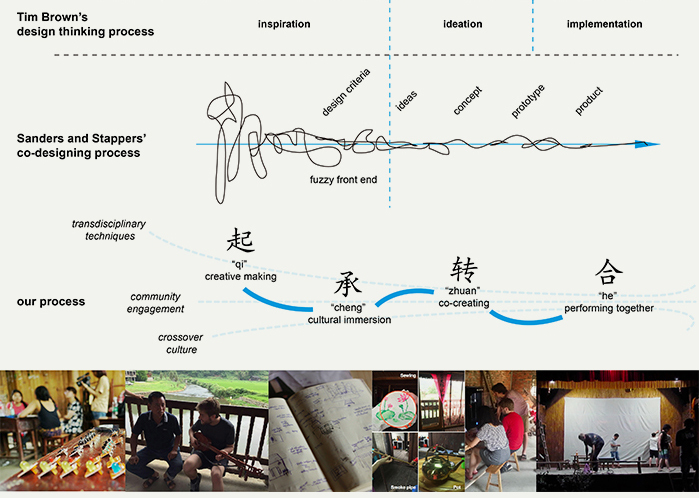 Drawing on Manzini’s (2011) view of a new social design model—“small, local, open and connected”—the “New Channel” program was initiated by Hunan University and partners in rural locations in 2009 as part of the DESIS China network. It became a series of open-ended social innovation practices involving hundreds of multidisciplinary participants from universities, industrial research institutions, design agencies, NGOs and social enterprises (see Figure 2). Figure 2. The “New Channel” program, in field since 2009. 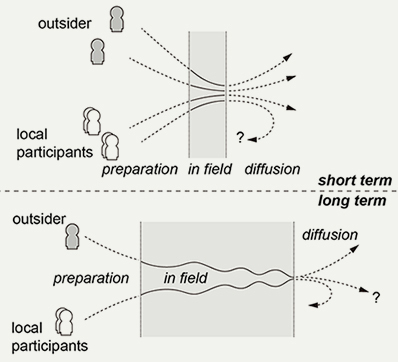 Short-term activities (see Figure 3) have typically been multidisciplinary, open-ended processes (Wang, 2008), aimed at inspiring outside designers with a quick dip into the local culture (Kelkar, 2007), and proposing innovative ideas to help with local issues. Typically the activities last one or two weeks with dozens of transdisciplinary participants rapidly applying in-situ and iterative techniques such as cultural probes (Gaver, Dunne, & Pacenti, 1999) and contextual bodystorming (Oulasvirta, Kurvinen, & Kankainen, 2003) without necessarily having clear objectives beforehand. Such immersive snapshots also benefit outside professionals by enriching their rural knowledge and broadening their cultural perspectives, especially in terms of inspiring their thinking for future work. However, from a local perspective, the direct benefit and long-term impact for local society are limited: the outputs are usually hard to root in local daily life and community after the outsiders have left, partly because of the shallow level of local engagement which reduces the perceived relevance for local lives. Figure 3. Comparison of short-term and long-term design processes. In contrast, long-term activities such as building a local design base, infrastructure upgrades such as internet access, water recycling and public sanitation, community empowerment, and longitudinal co-creation (Ji et al., 2014) typically have a clear purpose and set of expectations. They are supported by more stable links between the local community and particular outsiders, and by peer-to-peer partnerships between outside designers and local elites such as community leaders and craft masters. 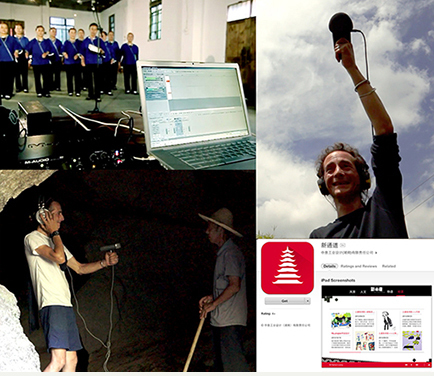 For example, in New Channel, a Swiss musician named Mati lived in Tongdao for more than one year, studying the Kam’s musical instruments and collecting traditional music, and then remixing these in his local studio (see Figure 4). Besides broadcasting the Kam’s music to outside audiences, he also contributed by acting as a cultural intermediary for local lives and by teaching English. His story was produced as a documentary film, A Bohemian in China (隐居中国), which was viewed over a million times online and broadcast by domestic TV channels, raising Tongdao’s profile, especially for Chinese tourists. However, although there were benefits, it was an “outside expert”-driven process heavily based on Mati’s personal experience and interest. The local participation was individual and piecemeal, and engagement with the community was indirect and passive. Figure 4. Mati’s recording and “New Channel” app. Another long-term example is the new product development (NPD) of traditional Gaeml brocade, the main cloth and fabric material for local people (Wang, Ji, & Jaafarnia, 2014). Since 2012, outside designers, textile experts and local craftswomen have collaborated to develop new ethnic weaving product categories, build a modern design base for resident designers, improve the traditional home-made looms, reinvigorate the family-based production network and explore e-commerce sales channels (see Figure 5). Figure 5. Brocade products development and e-store on Taobao.com. But such long-term processes are hard to replicate in other domains. The first reason is that it needs lasting commitment and serious participation from outsiders. The second is that it requires substantial effort to find qualified local partners and sustain motivation over extended periods, especially after the initial honeymoon period of co-creation. Furthermore, such a “heavy” process is often narrowly focused on one particular topic with a specific community segment, and finally, limited funds restrict a project’s impact on both social equality and broader community life. Unfortunately, it is also easy to cause a new inequality as a side effect of collaboration: local craft masters and elites who have more skills and social capital have more opportunity to benefit from such collaboration. So in our recent research practice, we have sought to focus on “short, broad and dialogical” processes which offer the chance to evenly balance local community development and engagement. The Cultural Intermediaries (CI) paradigm: cross-cultural study and a content-oriented production process. The methodology applied here is mainly quasi-ethnographic approaches by outside designers, including participatory observation, interviews and cultural inquiries. Typically communication design is the design discipline, mainly using new media technologies such as Mati’s recordings as discussed above. The Product–Service System (PSS) paradigm: an “artifact”-oriented development process such as participatory design, taking place in the local setting. For example, the Gaeml brocade case study in the New Channel program, where co-creation between designers and the local community grows beyond the traditional designer roles. The PSS paradigm has been widely adopted by researchers and practitioners, especially in product and service design disciplines. For example, Kam et al. (2006) conducted a design workshop at a rural primary school in northern India in which they built an equal relationship with teachers and students, and explored low-tech and high-tech prototype English language learning games with end-user programming tools to inspire the best designs. 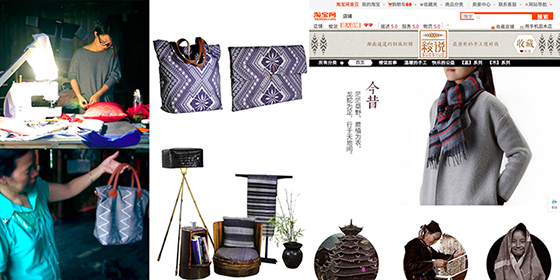 Another example is when Tung (2012) explored a craft–design collaboration and mutual learning process in which design students and local artisans worked together to unearth new opportunities for rush-weaving, a traditional Taiwanese handicraft, in contemporary markets. The Community Engagement (CE) paradigm: a more diverse, but mainly event-driven process based on public interests and rooted in short-term activities such as festivals. For example, Barbosa et al.’s (2015) work with local musicians in the Brazilian Northeast resulted in a public “jam” with and for the local community. In some cases, CI and PSS also involve community engagement as part of the approach, but the CE paradigm focuses on the integrated development of community and community empowerment through transdisciplinary activities. Table 1 summarizes the characteristics of these three paradigms using questions proposed by Woodhouse and Patton (2004), complemented with questions about other design aspects. Table 1. Comparison of design paradigms. In the last few years the focus of the New Channel program has shifted from CI to PSS, and recently to CE. The reasons for these shifts are on the one hand the shifting needs and interests of local development and public interest, and on the other hand the need for more effective approaches to collecting local wisdom, improving the local community core, and increasing local awareness and motivation in social design. In the rest of this paper, we present ways to develop the CE paradigm with transdisciplinary methods and co-creation processes, and then discuss key issues reflected from the facts. The value of the CE paradigm lies in the potential to engage with a wide range of local community members, to learn about the local culture, and to share in co-creation of cultural and material elements through transdisciplinary activities. The paradigm relies on a deep connection with a local culture of public arts to create publicly engaging activities which build on existing traditions and practices. In this study, there were some challenges in the design and implementation of the CE model. The first challenge was that our participants had quite mixed backgrounds: (a) six students and professional volunteers from London, with backgrounds from materials engineering and economics to geography; (b) five domestic graduate students from design disciplines; (c) six local musicians and performers; (d) three facilitators in design thinking, technical support and logistics; and (e) local stakeholders, storytellers, cultural representatives and participatory audiences. We used drama to drive co-creation as it provided a shared goal, specifically, putting on a public performance, it specified required roles and responsibilities, and, most importantly, it identified cultural and physical objects required for the performance to succeed. Note that this approach is quite different to using drama methods to structure the design process, or to collect data for the design process (e.g., Kankainen, Kantola, Mehto, & Tiitta, 2005): instead it drives the design process. Even though the outsiders had different professions, most of them had no drama or performance experience, and most local participants had no design or digital making experience; but on the other hand the Kam culture has rich musical and dramatic traditions which are at risk of decline in the face of mass media and popular music. The second challenge was how to keep all participants interested and motivated over two weeks. This required an agile and production-oriented process to build mutual respect, exchange knowledge, and spread design thinking throughout the making process. Facing these challenges, local representatives were involved in the discussion of the objectives and overall plan in advance. The public objective was that everyone would equally take part in co-creating an interactive drama, including its set, costumes and props, rehearsal, and performance on the public stage on the day after a local festival, New Rice Day (新米节). During the process, all participants would be expected to share and learn new concepts, cultures, and techniques from each other. Figure 6. The Community Engagement design process with interactive drama approach. “Qi”—creative making (two days): The whole process began with a creative making workshop to expose participants to new digital techniques and local resources. In the workshop, all participants learned the basics of open-source hardware, sensors, physical computing, making skills, and interactive sound and music techniques. The workshop also served to quicken outsiders’ immersion in the local context through tangible activities, and the tangible outputs gave local observers concrete examples for understanding digital interactivity and making. “Cheng”—cultural immersion (three days): In this section, mutual exchange was emphasized, with outsiders introducing their music, tales and relevant cultural elements reciprocally with the local community. In this stage mutual empathy developed between the groups, and groups reflected on their own ethnic elements from different cultural perspectives. The connection and trust built with the local community directly benefited the later co-creation steps below. “Zhuan”—co-creating (four days): The first stage of formal co-creation focused on “mixed making.” After brainstorming and selecting the theme democratically with the local community, participants were divided into script, costume and props, and set groups. Each group was tasked with planning their progress, selecting their approach, and maintaining good communication between groups and local musicians. Richly creative outputs emerged at this stage due to the open and equal atmosphere. Based on open discussion from different cultural perspectives about the classical romantic model, the script was developed as a traditional love story adapted from a traditional drama (see Figure 7). Scenarios were created collaboratively by outsiders and local storytellers to make sure they were culturally correct, and were visualized through storyboards. To make costumes and props, local participants shared their expertise in indigenous materials and techniques such as bamboo forming, their social connections to facilitate implementation, and their preference for performance styles. Various interactive objects were designed, from props to stage settings. All the designs were to be drawn from the local context. The participants had to consider new forms of performative tangible interaction (Sheridan & Bryan-Kinns, 2008), and the designs had to be ready for public interaction after the performance. “He”—performing together (four days): The second stage of co-creation shifted the focus onto “collaborative performing,” including interactive media elements such as background music, lighting, and scene switching. For better cross-cultural understanding, the whole drama was enacted without dialogue, through the use of body movements and gestures, music, and some narration. Local musicians created all the music by mixing traditional genres and their new cultural understanding gained from the outsiders (see Figure 8A). The outside performers and the local community worked together to design the postures and body language inspired by both traditional drama and Western musicals, for example the idea of using back projection and shadows (see Figure 8B). Rehearsal was also an iterative process of refining what had been designed in former stages, such as interactive props and installments (see Figure 8C). Figure 8. The stage of performing together: (A) musicians’ co-creation; (B) rehearsal for (re)creation; (C) interactive props. Given the inherent challenges of evaluating public interactive experiences in the wild (Bengler and Bryan-Kinns, 2014), the main evaluation method was interviews with all participants, supplemented by participatory observation, and audience questionnaires about the drama and interactive installations. More than 300 people attended the final performance, mainly nearby villagers, migrant workers who had returned home especially for this event, and some visitors. From an audience survey sampling 30 people (17 locals and 13 outsiders), the overall impression of the event was “very good,” and in interviews most audience members liked this form of public performance. A local young audience member stated that this drama was more vivid and attractive compared to traditional Kam dramas, which use only simple props and sets, and slow singing. The production had awakened his interest in his own ethnic culture. With regard to the co-creation process, local participants mentioned that some methods used by outsiders in the co-creation would inspire their future work and life. For example, the final scene of the drama used back projection onto the stage’s curtain to convey the idea of an afterlife (see Figure 8B) in which a reunion of the lovers takes place. The idea of using the projector to create shadows was developed by outside students based on modern Western musical productions, and the overall effect was positively received by the audience. Local musicians stated that they would consider using such staging effects in future local productions to help create an engaging and enticing spectacle for their audiences. This illustrates knowledge transfer arising directly from the co-creation (new staging techniques for local productions). A more indirect form of knowledge transfer is illustrated through the set design in which outside design students used physical mock-ups during the ideation stage to help with refining staging ideas (see Figure 9A), which also inspired local people to extend this method to other domains, such as public construction planning (Figure 9B) and community discussion. Figure 9. Unexpected knowledge transfer: (A) mock-ups used in set design; (B) local construction works. It can utilize existing craft traditions hand in hand with new technologies. However, the CE design process is difficult to create and sustain. Firstly, it is difficult to select a suitable public aim which both encourages spontaneous participation and is feasible within local limitations. Lots of themes may be meaningful but not all are suitable for CE because of differing local and foreigner knowledge thresholds, economic constraints, or the requirements for particular social positions or capital. Perhaps drama is not a perfect practice for the implementation of CE methods, but we found it useful as it brought together local stories with classical narrative structure, allowing both foreigners and locals to engage with, and co-create, the content. Secondly, in facilitating the process one needs to find a balance between giving participants total freedom to self-organize, which could lead to chaos and the loss of a common direction, and controlling the process too much, which can remove the space for peer-to-peer inspiration and serendipitous co-creation. Reflecting as well on the rural challenges mentioned above, a qualified social designer in the CE paradigm should be a good planner, communicator, and facilitator with enough social leadership ability to skillfully handle the co-creation process. This ability should be based on their rich experience not only from academic study, but also from years of hands-on learning in the field. Finally, the third challenge to creating and sustaining a CE process is how to sustain the positive influence of a short-term event in longer-term community development. Compared to CI and PSS, CE usually places more emphasis on the public good rather than on direct economic benefit. In many ways this reflects the co-creation focus on engagement with the creative act, rather than on the production of tangible outputs. Therefore, CE has the potential to produce longer-term impact in terms of shared knowledge, skills, and experience rather than direct commercial benefit; an example is the transfer of knowledge about using physical models, as mentioned above. Similarly, raising local awareness of technology such as digital making and tangible interactivity removes some of the local suspicions of technology and provides opportunities for future digital engagement. For the long-term realization of CE paradigms, alternative development models combined with crowdfunding, community reciprocity and even quasi-profitable activities would be worth exploring. It provides multiple roles and tasks for participants in contrast to conventional design which requires highly specialized skills. This lowers the bar for mass participation. It also allows participation from people with a wide range of disciplines, education and skills. It is easy to communicate clear and understandable objectives to all participants, derived from the requirements for planning a successful public event. This is in contrast to conventional design objectives, which are often opaque or abstract for non-designers. It has a clear, public output after one round of co-creation, which sustains public motivation for engagement. Furthermore, all participants and local people can gain non-material benefit from the outputs. For us, the non-economic benefit generated by community engagement could be equally enriching as potential commercial gain, especially in terms of increasing social equality. More design and making for the public good: For example, a group of participants found that local children who were supervised by grandparents lacked any sport experience and facilities, and so made an interactive soccer goal game to encourage them to take more exercise (Figure 10A, bottom). Another group found that local people have an unhealthy custom of drinking too much alcohol at festivals, so they made a playful public information service—an interactive digital clown with alcohol sensor which gave friendly advice on whether or not people should still drink more when singing karaoke at the feast (Figure 10A, top). New product designs inspired local crafts during costume making: In the zhuan stage some participants visited the Gaeml brocade workshop to make costumes. Because of the limited time available, they used pieces of traditional material to decorate modern clothing. This quick mix of modern and ethnic materials in turn inspired craftspeople to consider how to include ethnic attractions on mass-produced items. Positive social works such as teaching English, painting and IT knowledge to local primary students: For example, after visiting the nearby primary school to learn local children’s songs, a few British students volunteered to teach music to local children. 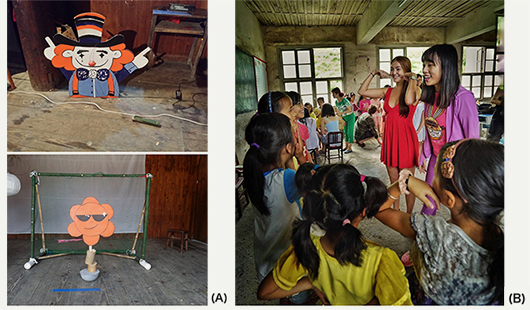 Their playful teaching skills in the rural classroom conditions (Figure 10B), with illustrations and performances, also inspired local teachers to improve their more conventional English language courses. Figure 10. More deliverables: (A) design and making for public good; (B) social works. The emergent design activities described above were not pre-planned, but were instead a direct result of the incremental trust built between the local communities and the outsiders during the co-creation of the drama. It is our view that these emergent design threads would not have come about in the short amount of time spent with the local community without the intense period of peer-to-peer co-creation and cultural immersion involved in realizing the CE process through drama creation. In our view, our drama-based approach provides a way to address the challenges of Mulgan et al.’s (2007) connected difference theory. These emergent design activities also illustrate the potential for the CE process to create positive social impact for local communities (e.g., improved English language teaching), and even potential economic benefits (e.g., new ideas for mass-produced ethnic products), which are not immediately obvious when co-creating a drama for a local audience. But the use of drama to drive CE also has its problems. Firstly, creating and crafting a drama can be quite a fuzzy and artistic process relying on collective intelligence, which is challenging on such a tight schedule. In this study serious effort was devoted to agile communication, seeking to strike a balance between openness for more creativity and the need to move forward with production and a dynamically changing schedule, which pushed a heavy workload onto the facilitators/social designers. Secondly, throughout the process, every participant needs to take on multiple roles, from learning and making to performing. Some participants found this requirement difficult, especially some junior students who did not have enough professional and social experience. In contrast, senior participants, who understood our hidden purpose, easily dived into self-motivated co-creation beyond the drama. Thirdly, for local people dramas traditionally focus more on the performance itself rather than creation of script, props, and sets, which reduces their attention to creative making. Some local musicians therefore could not understand why our schedule prioritized so much time for collaborative making (which we believe is important for building trust and knowledge transfer opportunities) at the expense of rigorous rehearsal. In terms of our design process, we found that quite a few participants had trouble in transitioning from the qi stage (creative making) to the cheng stage (cultural immersion). We had proposed creative making before cultural immersion to allow participants to frame their future design thinking in terms of the practicalities of what could be created in situ. In retrospect, cultural immersion first might have provided more grounding for the creative work. Another problem was the rapid iteration in the he stage (performing together). Because of the restricted schedule, there was very little time to allow participants to rethink and refine their artifacts created in the zhuan stage (co-creating) even though some of them had already identified new design ideas and changes during co-creation. If time allows, more exchange between the zhuan and he stages should be encouraged, which would lead to more design findings. The local challenges for social designers arising from the required multiplicity of roles, the realities of rural life, and the complexity of local context including ad-hoc networks and diverse knowledge backgrounds, need to be taken into account when undertaking CE projects. For planning a well-structured short-term process taking into account local complexity and uncertainty, the core social designers in the Tongdao case study started the initial work six months in advance of the event, and visited the sites several times to evaluate the pragmatic feasibility of the project, including screening local candidates and developing informal but important social networks with local people. For social designers, the effort spent in the field before the official kick-off is worthwhile, and should be encouraged to help address the realities of collaboration in rural settings. Being able to handle such complexity is a key role that social designers must now take on as the facilitator with a dialogical attitude. Our Tongdao case study also shows the importance of “on the ground” learning in combination with classroom-based education if social design is to develop as a discipline in future. 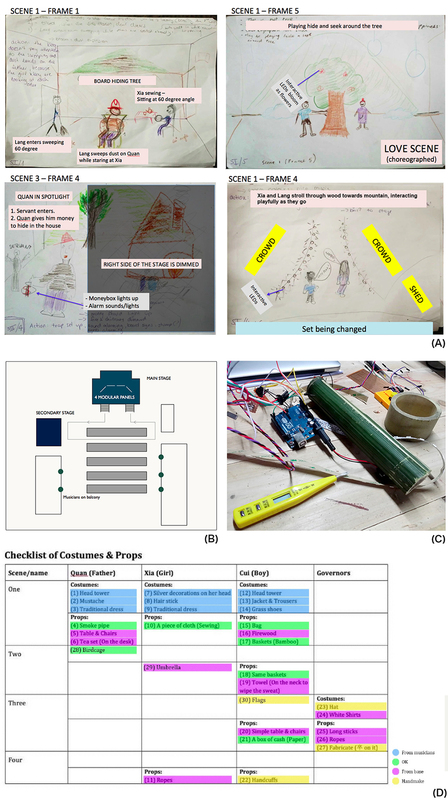 The design focus of the New Channel case studies presented in this paper shifted from CI, to PSS, and on to CE in an attempt to increase the engagement of local communities in co-creation. We believe that the CE case study, including the content of the drama (built on traditional stories, music, and clothing) and the sustained engagement of the local community in the co-creation of the drama, illustrates that we successfully engaged local people (end users) as equal partners in the co-creation process, as emphasized by Sanders and Stappers (2008). Through our case studies we moved from a focus on sustainable product development such as Jin et al.’s (2014) Future Living Studio, to prioritize social design that engages a local community in co-creation with outsiders. Whilst our approach to CE did not explicitly ask local communities to think about and design their own futures (cf. Burkett, 2016), we did draw on local community ingenuity and locally available resources in keeping with Burkett. Furthermore, our use of drama as a way to structure the CE process supports knowledgeable participation by local communities and outsiders (cf. Woodhouse & Patton, 2004), and goes some way to reducing the inequalities of rural craft collaborations identified by Murray (2010). The drama-based approach also provided a creative framework in which we found that empathy between co-creators quickly emerged—a key requirement for successful co-creation proposed by Fleischmann (2013). The drama itself was inherently bound to the short time spent in the rural location by the outsiders and so exemplifies the typical lack of sustainability of social design projects in rural communities found by Kensing and Blomberg (1998), but this is balanced by the design activities which emerged during the co-creation of the drama, and the knowledge gained by local participants which provides opportunities for sustainable social (e.g., changes to language teaching) and economic (e.g., innovations in traditional textile production) impacts beyond the collaboration. The aim of our CE approach was to cultivate the core characteristics of local communities in keeping with Manzini’s (2011) “small, local, open and connected” design model for long-term local self-development rather than providing unique one-off solutions. From the results discussed above, CE has shown its advantages through deeper community engagement, better local acceptance and richer co-creation in contrast to more individual, passive and piecemeal participation models such as CI. However, as discussed here, the CE model’s long-term contribution is more inspirational and tangential than the PSS model’s. A combination of CE for early stage co-creation and PSS for long-term development might prove an effective approach to sustainable design. We believe that using drama to structure our CE process has shown itself to be an effective approach to social design by: (i) facilitating and building community consensus, the importance of which is emphasized by Winschiers-Theophilus et al.’s (2012) dialogical approach; (ii) helping to preserve cultural identity, which Hoffert (2006) identified as critical in a globalizing culture; and (iii) building on traditions of creating, which are at risk of being eroded by mass production (Murray, 2010). By doing this the local community has the potential to generate sustainable and customized solutions responding to local issues. It is a social designer’s responsibility to cultivate these characteristics for long-term local self-development rather than providing unique one-off solutions. We found that the CE model provides a catalyst to inspire development but relies on other models such as PSS to sustain self-development in the long term. The CE approach in rural co-creation is transdisciplinary, drawing from the disciplines of music, interactivity, performance and drama and the spatial arts. It is a non-traditional creative arts/design approach to social design, building on indigenous community consensus. As we have discussed, such non-traditional design approaches have advantages as well as quite a few areas for improvement. We would like to emphasize the importance of the hidden purpose of community engagement which serendipitously engages people in co-creation, behind the public aim of entertainment. These indirect outputs and open-ended creativity may be controversial for social design and its management, and its effectiveness in transferal to other communities with cultural differences may be untested, but they are starting points for developing the methodology of CE in future. This work was sponsored by the Fundamental Research Funds for the Central Universities, the Chinese Science and Technology Research Program (2015BAH22F00, K1306027-11), Markor Furnishings’ donations in various years, and Engineering and Physical Sciences Research Council (UK) grant EP/J017205/1. We would like to thank Dr. Benedikt Bengler, Prof. Youyu Jiang, Prof. Sunghee Ahn, student volunteers from Queen Mary University of London and Hunan University, local musicians and all those who participated for their tireless support of this work. We would also like to thank the anonymous reviewers and editors for their helpful comments. 1. Co-creation structured as a design process is usually referred to as co-design (Sanders & Stappers, 2008). Ambole, L. A., M’Rithaa, M. K., Moalosi, R., & Molokwane, S. (2012). DESIS-Africa: Design thinking for social innovation and development. In Proceedings of the 2nd International Conference on Design, Development, & Research (pp. 192-200). Cape Town: Cape Peninsula University of Technology. Bannon, L. J., & Ehn, P. (2012). Design: Design matters in participatory design. In J. Simonsen & T. Robertsen (Eds. ), Routledge international handbook of participatory design (pp. 37-63). New York, NY: Routledge. Barbosa, J., Calegario, F., Tragtenberg, J., Cabral, G., Ramalho, G., & Wanderley, M. M. (2015). Designing DMIs for popular music in the Brazilian northeast: Lessons learned. In Proceedings of the 15th International Conference on New Interfaces for Musical Expression. Baton Rouge, LA: Louisiana State University. Barker, T., & Hall, A. (2009). GoGlobal: How can contemporary design collaboration and e-commerce models grow the creative industries in developing countries? In Proceedings of the 3rd Conference of International Association of Societies of Design Research (pp. 2227-2236). Seoul, Korea: Korea Society of Design Science. Bengler, B., & Bryan-Kinns, N. (2014). In the wild: Evaluating collaborative interactive musical experiences in public settings. In L. Candy & S. Ferguson (Eds. ), Interactive experience in the digital age (pp. 169-186). New York, NY: Springer. Bergvall-Kåreborn, B., & Ståhlbröst, A. (2008). Participatory design: One step back or two steps forward? In Proceedings of the 10th Anniversary Conference on Participatory Design (pp. 102-111). New York, NY: ACM. Bidwell, N. J., & Winschiers-Theophilus, H. (2012). Audio pacemaker: Walking, talking indigenous knowledge. In Proceedings of the South African Institute for Computer Scientists and Information Technologists Conference (pp. 149-158). New York, NY: ACM. Brown, T. (2008). Design thinking. Harvard Business Review, 86(9), 84-92. Carroll, J. M., & Rosson, M. B. (2007). Participatory design in community informatics. Design Studies, 28(3), 243-261. Cipolla, C., & Bartholo, R. (2014). Empathy or inclusion: A dialogical approach to socially responsible design. International Journal of Design, 8(2), 87-100. Fleischmann, K. (2013). Social entrepreneurs and social designers: Change makers with a new mindset? International Journal of Business and Social Science, 4(16), 9-17. Gaver, B., Dunne, T., & Pacenti, E. (1999). Design: Cultural probes. Interactions, 6(1), 21-29. Gong, M. (2014). Design for Chinese social innovation: Pilot PSS design experiences for sustainable lifestyles. In C. Vezzoli, C. Kohtala, & A. Srinivasan (Eds. ), Product-service system design for sustainability (pp. 336-344). Sheffield: Greenleaf Publishing. Hughes, J., King, V., Rodden, T., & Andersen, H. (1995). The role of ethnography in interactive systems design. Interactions, 2(2), 56-65. Jin, S., Crul, M. R. M., & Brezet, J. C. (2014). Future living studio: Socio-technical experiments in sustainable design. In Proceedings of the 10th International Symposium on Tools and Methods of Competitive Engineering (pp. 1209-1224). Delft, the Netherlands: Delft University of Technology. Ji, T., Yang, Q., & Wang, W. (2014). Design and social innovation. Design practice and methods based on networks and communities. In C. Vezzoli, C. Kohtala, & A. Srinivasan (Eds. ), Product-service system design for sustainability (pp. 345-360). Sheffield, UK: Greenleaf Publishing. Kam, M., Ramachandran, D., Raghavan, A., Chiu, J., Sahni, U., & Canny, J. (2006). Practical considerations for participatory design with rural school children in underdeveloped regions: Early reflections from the field. In Proceedings of the Conference on Interaction Design and Children (pp. 25-32). New York, NY: ACM. Kankainen, T., Kantola, V., Mehto, K., & Tiitta, S. (2005). Interactive drama and user centered product concept design. In Proceedings of the Conference on Designing for User eXperience (pp. 2-9). New York, NY: American Institute of Graphic Arts. Kelkar, A. (2007). “A quick dip at the iceberg’s tip” - Rapid immersion approaches to understanding emerging markets. In N. Aykin (Ed. ), Usability and internationalization. Global and local user interfaces (pp. 103-108). Berlin, Germany: Springer-Verlag Berlin Heidelberg. Kensing, F., & Blomberg, J. (1998). Participatory design: Issues and concerns. Computer Supported Cooperative Work, 7(3-4), 167-185. Lin, R. T. (2007). Transforming Taiwan aboriginal cultural features into modern product design: A case study of a cross- cultural product design model. International Journal of Design, 1(2), 45-53. Lundestad, G. (2004). Why does globalization encourage fragmentation? International Politics, 41(2), 265-276. Manzini, E. (2011). The new way of the future: Small, local, open and connected. Social Space, 100-105. Manzini, E. (2015). Design, when everyone designs. Cambridge, MA: MIT Press. Margolin, V., & Margolin, S. (2002). A “social model” of design: Issues of practice and research. Design Issues, 18(4), 24-30. Merkel, C. B., Xiao, L., Farooq, U., Ganoe, C. H., Lee, R., Carroll, J. M., & Rosson, M. B. (2004). Participatory design in community computing contexts: Tales from the field. In Proceedings of the 8th Conference on Participatory Design (pp. 1-10). New York, NY: ACM. Mulgan, G. (2006). The process of social innovation. Innovations, 1(2), 145-162. Mulgan, G., Tucker, S., Rushanara, A., & Sanders, B. (2007). Social innovation: What it is, why it matters and how it can be accelerated. London, UK: Young Foundation, Oxford Said Business School. Muller, M. J. (2002). Participatory design: The third space in HCI. In J. A. Jacko & A. Sears (Eds. ), The human-computer interaction handbook: Fundamentals, evolving technologies and emerging applications (pp. 1051-1068). Mahwah, NJ: Lawrence Erlbaum Associates. Murray, K. (2010). Outsourcing the hand: An analysis of craft-design collaborations across the global divide. Craft+ Design Enquiry, 2, 1-24. Negus, K. (2002). The work of cultural intermediaries and the enduring distance between production and consumption. Cultural Studies, 16(4), 501-515. Oulasvirta, A., Kurvinen, E., & Kankainen, T. (2003). Understanding contexts by being there: Case studies in bodystorming. Personal and Ubiquitous Computing, 7(2), 125-134. Sanders, E. B.-N., & Stappers, P. J. (2008). Co-creation and the new landscapes of design. CoDesign, 4(1), 5-18. Sanders, E. B.-N., & Stappers, P. J. (2014). Probes, toolkits and prototypes: Three approaches to making in codesigning. CoDesign, 10(1), 5-14. Schumacher, E. F. (1973). Small is beautiful: A study of economics as if people mattered. New York, NY: Harper and Row. Sheridan, J. G., & Bryan-Kinns, N. (2008). Designing for performative tangible interaction. International Journal of Arts and Technology, 1(3/4), 288-308. Smithsonian Institution (2013). Design and social impact: A cross-sectoral agenda for design education, research and practices. New York, NY: Cooper Hewitt, Smithsonian Design Museum. Tung, F.-W. (2012). Weaving with rush: Exploring craft-design collaborations in revitalizing a local craft. International Journal of Design, 6(3), 71-84. Wang, W. (2008). Exploring mobile user experience in rural Chinese context. The Journal of Designing in China, 1(3), 34-37. Wang, W., Ji, T., & Jaafarnia, M. (2014). Position designer into the craft revival of emerging markets: A case study on Chinese ethnic brocade industry. In Proceedings of the 19th Conference on Design Management in an Era of Disruption (pp. 187-204). London, UK: Design Management Institute. Winschiers-Theophilus, H., Bidwell, N. J., & Blake, E. (2012). Community consensus: Design beyond participation. Design Issues, 28(3), 89-100. Woodhouse, E., & Patton, J. W. (2004). Design by society: Science and technology studies and the social shaping of design. Design Issues, 20(3), 1-12. Zurlo, F., & Bohemia, E. (2014). Editorial: Designers as cultural intermediaries in an era of flux. In Proceedings of the 19th Conference on Design Management in an Era of Disruption (pp. 5-8). London, UK: Design Management Institute. International Journal of Design is a peer-reviewed, open-access journal. All journal content, except where otherwise noted, is licensed under the Creative Commons Attribution-NonCommercial-NoDerivs 2.5 License.